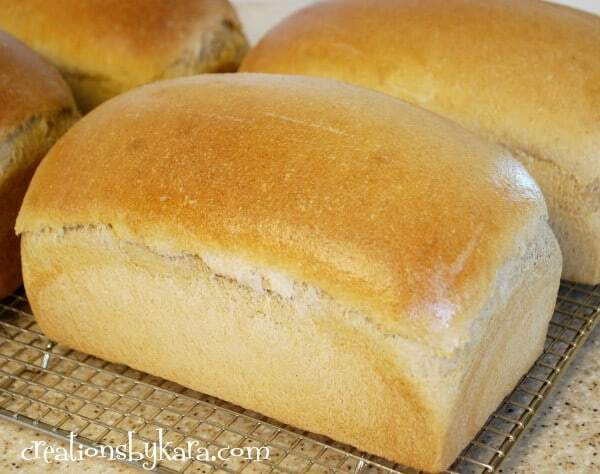 I have tried many, many wheat bread recipes over the years and this is my very favorite. It is fast, easy, and virtually fool proof. It only requires one raising time, so you can have warm bread in your mouth in less than 90 minutes. I try to time it so the bread is coming out of the oven when we have just finished a meal and everyone is full. Otherwise my husband and four boys (ok, and me too) can finish off two loaves before they have even had a chance to cool. It freezes well if you can manage to get some wrapped up and in bags before it is devoured. It makes great sandwiches and toast, just make sure you don’t over-bake it. Mix water, oil, honey, salt, gluten, and white flour. (I use my Bosch mixer because I am too lazy to do this by hand.) Add 4-5 cups of wheat flour and yeast, beat till smooth. Add remaining flour, enough that the dough is sticky but doesn’t stick to your finger. Knead for 5 minutes in the Bosch. If you don’t have a Bosch or similar mixer and have to do this step by hand, it will be quite a workout. You will earn at least 2 extra pieces of warm bread, probably with butter. (But your arms will be to tired to lift it to your mouth.) Anyway, divide the dough between four 8″x4″ greased bread pans. Let rise for about 30 minutes or till doubled. Bake at 350 for 25-30 minutes or till very lightly browned. Brush tops with melted butter. 1- Use WHITE WHEAT! Hard red wheat works, but white wheat makes a much softer and fluffier loaf. If all you have is red wheat, you can use more white flour and less wheat flour and it will be almost as good. But white wheat totally Rocks! Hi Kara, I was just looking at this recipe and in the instructions you have listed potato flakes, but I don’t see it in the ingredient list. How much do you use? This bread looks so yummy and I want to try it! !